Your opportunity to catch up on the world’s latest tastes, creations and ideas in a whole wide range of lifestyle products and services, from gourmet foods, fine wines and cigars to home décor, appointments and appliances, to health and wellness, fitness and spa. Admission is free, and so are the many samples of fine wines, spirits, cheeses, gourmet chocolates, and an abundance of other mouth-watering delicacies. Plus, you'll find lots of great deals and offers ranging from gourmet foods, household items and premium lifestyle products from all corners of the globe. Bring the whole family - after all, there's literally something for everyone: a whole host of exhibits, informative workshops, exciting stage shows, amazing lucky draws, dips and discounts! So don't miss out - make a date now to be at the Fair on Friday 16th, Saturday 17th and Sunday 18th of September, at the Sime Darby Convention Centre. Remember, admission is free, parking is free, and access is easy, wherever you live in KL. Come along and enjoy the finer things in life - you're worth it! 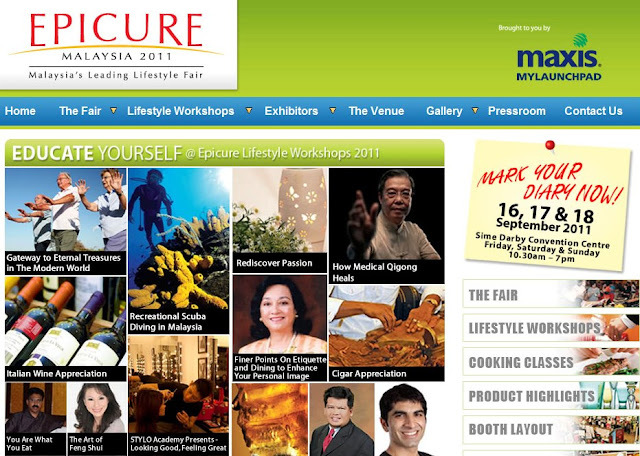 Almost anything you wish to learn about a great life and lifestyle can be found at Epicure Malaysia. From Health and Wellness, Cigar, Coffee and Wine Appreciation to Luxury Property and Personal Security, there's something to inspire, inform, educate and benefit everyone.